Le Cercle De Carteret Jersey Reunion 2017. John George De Carteret met all the group attending our Le Cercle De Carteret weekend at the Societe Jersaise Head Quarters, in Pier Street. John presented his line of De Carteret family research. We were shown documents and family photos. He explained that during the time spent gathering all documentation for the project, he discovered through looking at his Grandfathers details, he had Uncles and Aunts, also cousins he had previously not known about. Our family group also shared their interest in recognising their links to the De Carteret name. 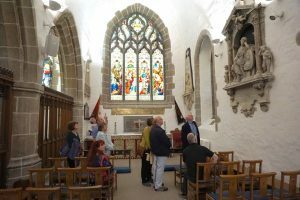 Because John George is a member and volunteer of both Societe Jersaise and The Jersey Archives, he organised a special visit for our group on a Saturday morning to the Jersey Archives, St Helier. 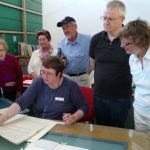 We were very grateful for the volunteer staff who came to give the tour, we were shown how they take great care storing the bequeathed documents. Trudi our guide had prepared a display of some De Carteret documents she knew would be of interest to us. One very old deeds of sale, a document was particular interest as it was pertaining to a claim for reimbursement of goods lost while under Nazi Occupation. These and other documents are available to view. For anyone who wishes to use this research tool Jersey Archive membership is essential. Trudi from Jersey Archives showing a very interesting De Carteret piece of information. Saturday evening some of the group joined a walking tour of St Helier. This was headed by Ned Malet de Carteret a Blue Badge accredited guide. Ned seen here is explaining the Town church monument dedicated by the De Carteret Family. An evening at The Quayside Restaurant, St Helier, organized by Denise De Carteret where we had a very good evening meal. Martyn Sayer the owner of the restaurant is very interested in the “De Carteret” family history, he has written an article about Sir George Carteret, which he presented to Le Cercle De Carteret. The article describes how Sir George Carteret and his family helped King Charles the Second while fleeing to Jersey during the English civil war. The King honoured The De Carteret’s and Jersey’s loyalty in 1645. The history can be found on Wikipedia or Books written about George Carteret’s life and times. Tantivy Bus Company organised by John George De Carteret, collected all our group from the various hotels in St Helier. Our first stop was La Hougue Bie Prehistoric Burial Chamber that is under a large hill mound which has a medieval chapel on top of the mound. There is a German bunker also in the area of Jersey Heritage site. On special display in the premises at the side of the Burial Chamber is the spectacular Jersey Hoard which was found in a field, the huge soil and clay bound hoard has coins and gold jewellery still to be uncovered. It now has a permanent home at the museum. A display of various Geology and other information about Jersey’s natural history is also on display including artefacts discovered by archaeologists through the ages. Close by are stones from the various Prehistoric tombs with descriptions of where the stones were originally placed in Jersey countryside. 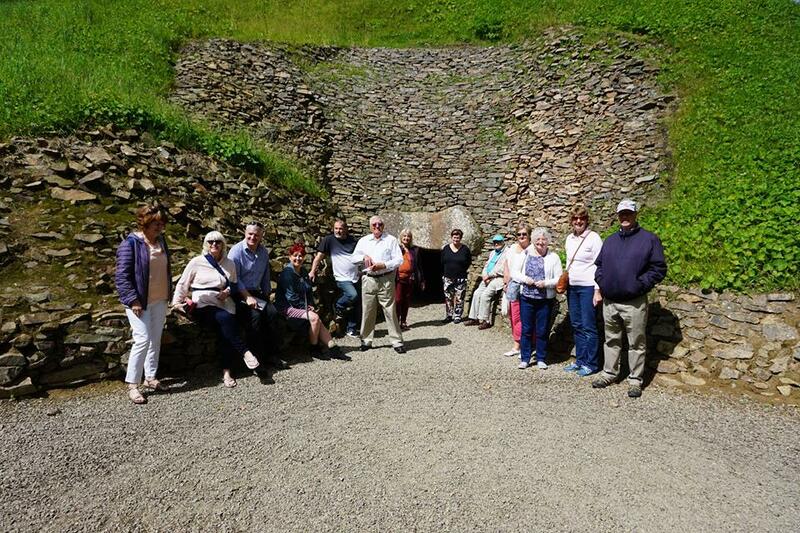 The Chairman of Le Cercle De Carteret with members and Friends outside the Burial Chambers of La Hougue Bie, Jersey. 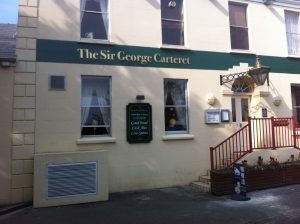 Lunch was held at “The Sir George Carteret” for 20 people. Although the sign outside the premises advises that they do not accommodate large coach parties, we had secured a booking for our gathering and having the name De Carteret being relatives were welcomed and had a lovely English Sunday lunch. The Sir George Carteret Restaurant and Pub. A statue of George stands close by. Our “Tantivy” coach had been hired for most of the day. We drove through the lovely Jersey countryside and on to St Ouen’s Manor. We were welcomed by Charles and Georgina Malet de Carteret, and Charles brother Ned Malet de Carteret. 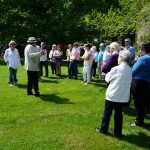 Charles and Georgina opened their home to our group, Charles gave the group all the detailed history about the construction of the Manor and also pointed out the Family portraits of people who previously lived in the Manor throughout its history. On our tour of the gardens Charles described how his forebears had constructed the garden which is there today, we were shown a memorial to Monsieur Francis Scornet. A Frenchman who with other men sailed into St Peter Port, Guernsey, June 1942. They were escaping from France and mistakenly took Guernsey for the South of England. Little did they realise that the Channel Islands was occupied by the Nazis. Unfortunately Francis Scornet was suspected as being the ring leader and taken to Jersey, he was executed at St Ouen’s Manor as a warning to the population. 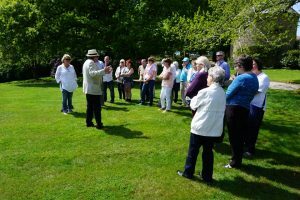 Every year a memorial service is held in the gardens and attended by French delegates. 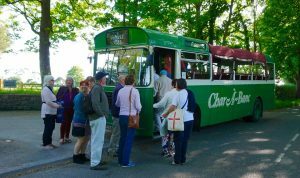 At 5.30 we were collected by an open topped vintage bus, Denise De Carteret organised and arranged the tour in memory of John Philip De Carteret one of our founder members, who passed away in 2015. We had very scenic hour long tour. With special permission to drive through the grounds of Trinity Manor. Which at one time was also the home of the De Carteret’s in Jersey. My great-great-grandmother was Mary Anne de Carteret, born in Sark who was married to John Marett in the late 1800s. Her father was Phillipe de Carteret, born in Sark. I would be interested to hear of any family connections.